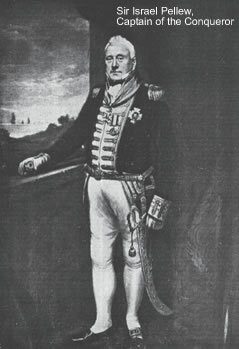 Sir Edward Pellew, later Lord Exmouth, was one of the most charismatic commanders of the Royal Navy in the Revolutionary and Napoleonic Wars, and the inspiration of many incidents in naval fiction. His fame has however served to make the name of his younger brother Sir Israel Pellew (1758-1832) less well known, even though he himself was to have a successful career, serving with distinction at Trafalgar as captain of HMS Conqueror and achieving the rank of full Admiral. 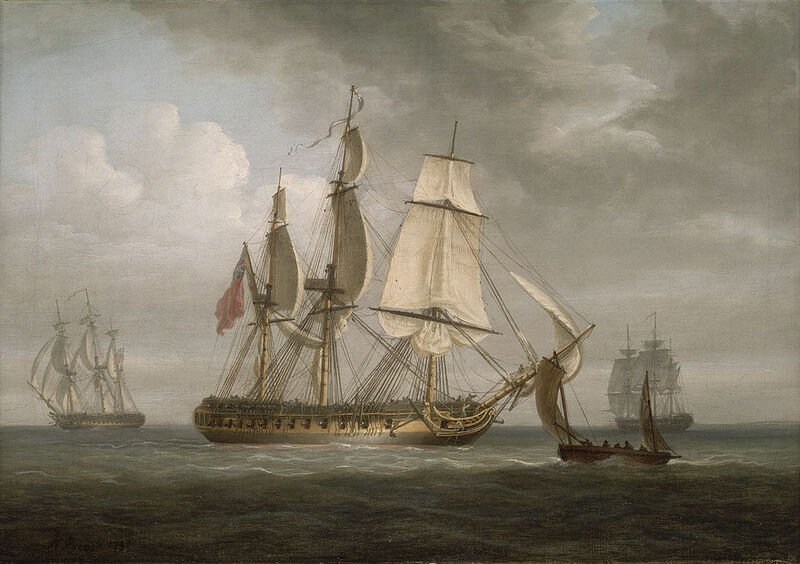 His career did however come very close to a dramatic termination in 1796 when in command of the 32-gun frigate HMS Amphion, which he had taken over the previous year. 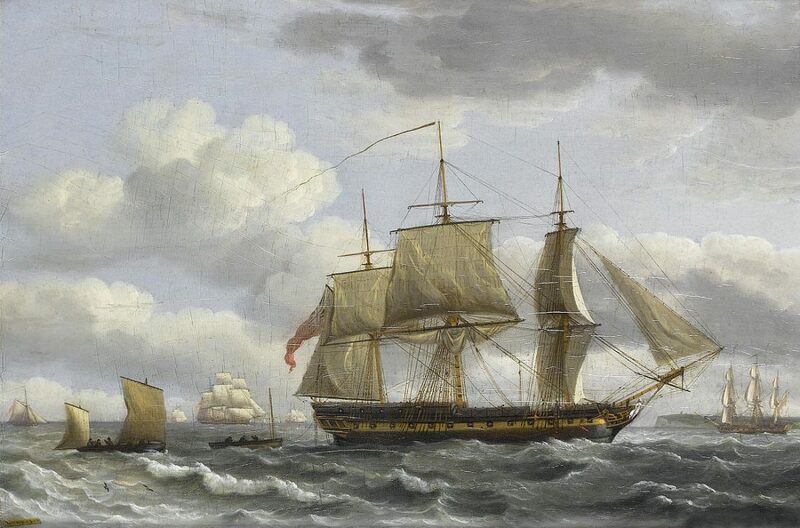 Assigned to Western Frigate Squadron, of which his brother was commodore, a hard gale that damaged Amphion’s foremast obliged Captain Israel Pellew to take his ship into Plymouth for repairs. She was moored between two other vessels, one a sheer hulk – a hull fitted with lifting equipment for lowering masts into position on other craft – and the second a receiving ship, an old vessel used for port accommodation. As Amphion’s stay in port was to be a short one her magazines were fully stocked and as Plymouth was her home port large numbers of relations and friends of the crew had come on board. On the afternoon of 22nd September possibly as many as a hundred non-crew members, many of women and children, were on the ship and two separate dinners were big hosted by officers. One of these was being given by Captain Pellew himself in his cabin at the stern. At four-thirty, while Pellew was drinking wine with another captain, William Swaffield of HMS Overyssel and with his first lieutenant, Amphion blew up. 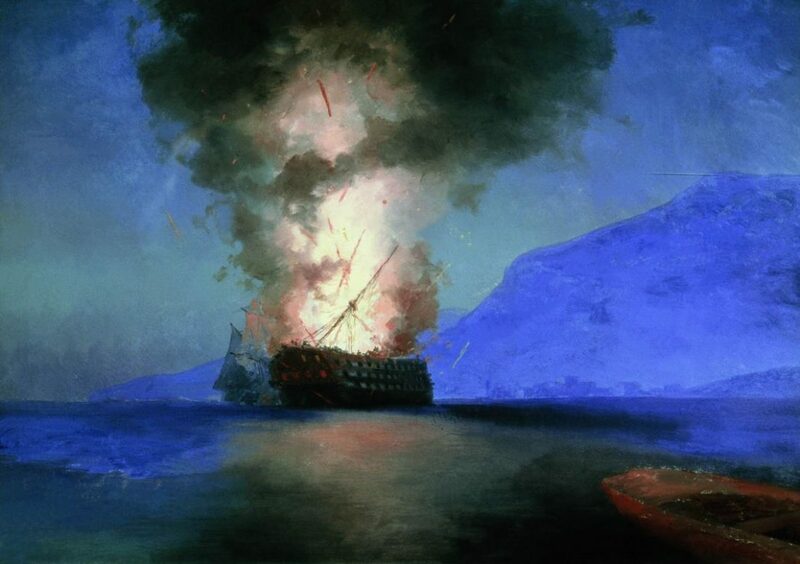 Later eye-witness testimony by a midshipman on another ship indicated that the ship suddenly appeared to rise, wholly upright, so far above the water as to reveal her keel, and a huge explosion followed. The masts were thrown into the air and the shattered hull sank immediately. The vessels moored on either side remained afloat – the force of the explosion seems to have been directed wholly upwards rather than outwards. The sound carried over a long distance and the sky above the dockyard glowed red, initiating consternation in the town while the cause was still unknown. On hearing the explosion, the port-admiral, Sir Richard King, went immediately to the scene and boarded the sheer hulk. He found its deck strewn with blood and body parts, with the shreds of the Amphion’s pendant and rigging, and with pieces of shattered timber. The carnage proved horrendous and many survivors plucked from the water had lost limbs or were hideously burned. Body parts were subsequently collected in sacks and brought, like the survivors, to Plymouth’s Royal Hospital for identification. The hospital as besieged by desperate relations seeking information but, given the rudimentary medical provisions of the time, little could be done for the injured. One appalling story later reported was that one of the sailors’ wives had a young child in her arms when the explosion occurred. Shock caused her to hold it so tight that, though only her torso was afterwards found, the child survived, locked in her arms. One wonders about its subsequent fate. The final death toll was never established with certainty, but was likely to have around 300. Relatively unscathed were four men who had been in the mast tops at the time, and who were blown clear, and so too was a sailor’s wife. The marine sentry who had been at the door of Pellew’s cabin also survived. The boatswain had been on the forecastle, supervising the men in rigging of the jib-boom, when he was thrown up by the explosion and was entangles in the rigging, from which he was cut free by rescuers from a nearby ship. Another man was trapped inside the sunken hull for over five minutes and only escaped by hacking his way through wreckage in the gun-room with his knife. In Captain Pellew’s cabin, he and his guests were thrown from their seats and stunned. Pellew had however sufficient presence of mind to head to the windows, and seeing the two hawsers, one slack and the other taut. He launched himself outwards and managed to hold on to one of them. His first lieutenant followed suit but Swaffield of the Overyssel was not so lucky and his body was only found a month later. Pellew himself was so badly shocked that, after he had been brought ashore, he was hardly aware of where he was or what had happened. An enquiry into the disaster was initiated by the port-admiral and various theories – many wild –were advanced as to the cause. Though this was never ascertained with total certainty, a grisly discovery some weeks later may have thrown light on it. Salvage efforts had been initiated immediately and bodies were released from the wreckage in the process. Also recovered was a sack containing gunpowder, disguised with a layer of biscuit over it. It was surmised that the Amphion’s gunner might have been stealing gunpowder and taking it ashore to sell. He had apparently been seen drunk earlier in the day and, as a consequence, might have neglected essential precautions in the magazine. There may have been a more prosaic explanation however – Pellew disbelieved the theory about the gunner and complained that the magazine was poorly constructed and unsafe. The loss of the Amphion did not damage Pellew’s career. Five months later, recovered from the effects of the explosion, he was appointed to command of another 32-gun frigate, HMS Greyhound. He suffered the indignity of being put ashore by her crew during the Nore mutiny. He resigned Greyhound’s command thereafter but took over yet another 32-gun frigate, HMS Cleopatra. Years of action – and the glory of Trafalgar – lay ahead.